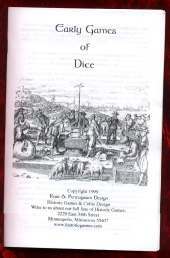 There are a number of dice games that require 5 dice, so here's a special. Order five of our bone colored Dragon Dice, Nightmare Dice, or Ancient Dice and will give you $5.00 off the regular price! Don't forget to indicate which kind of dice you want using the pull-down menu below. Made by us here in Minnesota.